Tinder and Twitter have certainly opened our eyes to the vast numbers of chads, mansplainers, and full-on misogynists out there trying to date et al, but that isn’t necessarily the worst thing. I mean, it’s a little devastating to see just how many men seem to have been raised by barnyard animals, but at least they show their true colors immediately, meaning face-to-face interaction is kept at a minimum. 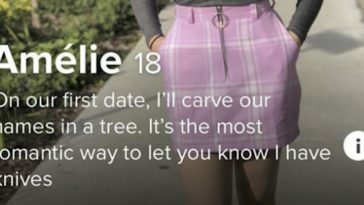 Oftentimes, a glance at a Tinder bio tells you everything you need to know about an individual. But sometimes, it goes as far as a date. 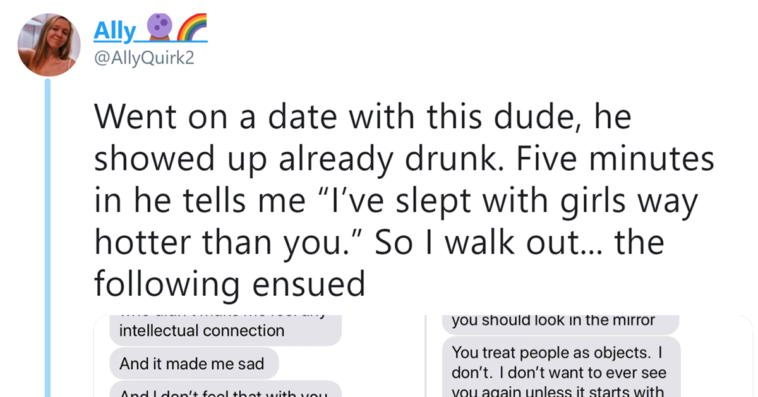 That’s what happened to Ally (@AllyQuirk2), who recently went on a date with a guy she says showed up drunk, only to immediately neg her. “Five minutes in he tells me ‘I’ve slept with girls way hotter than you,'” Ally recounts. “So I walk out… the following ensued,” she wrote, alongside screenshots not of the conversation—as it was decidedly one-sided—but of the barrage of texts she was inundated with immediately afterwards. Essentially, this dude voiced the impossibility of conventionally attractive women being intelligent and called Ally…physically asymmetrical?—all of which she was supposed to take as a compliment. Then, when he gives her the choice of replying or deleting him and never contacting him again, Ally chooses the latter. Which…really triggered our boy. Naturally, Twitter began clowning this insecure man for not only negging and then gaslighting Ally, but for flying into a rage when he told her to stop responding and she actually did. But in all seriousness, the situation was potentially dangerous, and we’re grateful Ally was able to excuse herself from it safely. “Men are trash” comments abounded—but before y’all start yelling—yes, not all men are trash. Just the ones who claim toxic masculinity as a personality quirk. In fact, Ally challenged the men claiming to be better than her date to prove it by reimbursing her for her Uber. And one dude actually did!